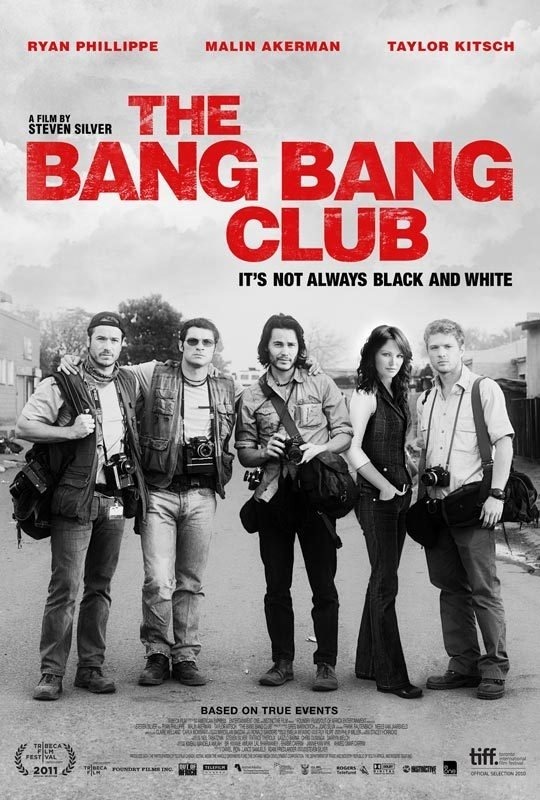 When I was still a student studying photography, I learned about the Bang Bang Club in photographic history. For some reason I was strongly drawn to this story of four South African photographers covering the last days of township violence before the 1994 elections. My lecturer strongly recommended I go to the school library and read the book. I did and quickly fell in love with the book. Long story short, it is a great read. I’d go so far as to say it’s one of my favourite books, not because it’s local, or because it’s photography related. But because it really is that good. It’s action packed, full of drama and hard to put down. Marinovich and Silva tell a compelling story well. When reading the book, I thought to myself, “this would make an amazing movie.” Imaging my excitement when I heard it was going to be turned into a full length feature film. Lets get the obvious and most noticeable out of the way. The accents. Three of the main cast members are well known American actors. Ryan Phillipe as Greg Marinovich does a fairly accurate impersonation of what is, for some reason, a very difficult accent to copy, but it is still a bit off but it is acceptable. Kevin Carter’s character was played by Taylor Kitsch. His accent sounded more Irish than anything else. His use of typical South African slang was the only thing letting you know he was actually portraying a “S’affer.” On a more personal note, as a South African of Portuguese origin myself, it’s particularly annoying that no one ever pronounces Joao’s name correctly in the entire film. Now on to more important things. How the story was portrayed. For me the movie was quite mixed. At times the story was very well replicated and went exactly as I imagined in my mind’s eye after reading the book. But often the story deviates from actual events and even sometimes changes the story completely. (Spoiler alert. If you have no knowledge of the story line and want to watch the film, stop reading now) For example, the motive behind Kevin’s death in the movie was changed from actual events, I imaging to make the story more compact and entertaining on film, which is the main reason for the downfall of most movie adaptations of books. It’s quite sad it happened to such a great story but it’s particularly sad because these are real people who’s stories are being told, and being told wrongly to the discredit of the people who lived the events, some of whom are no longer alive to speak out and correct the twists of the movie. I imagine people who knew Carter, like his daughter, who is still alive today, wouldn’t want to see her father portrayed in that matter. Many of the topics covered in both book and movie and still very sensitive and fresh in many peoples memories and I feel the movie dishonors the memories of the people involved. Story wise, many key points are raised but aren’t answered, unlike in the book. Vital moments are rushed through very quickly and the necessary amount of time wasn’t spent delving deep into the reasoning and motivations of characters. For those who haven’t read the book, I feel they would be somewhat left in the dark with the lack of explanation at many times. Too many important details were left out of the story. There are some good one liners and even a few good laughs during the movie, but again, those laughs come at the expense of the characters credit, and go against what they were really like, so for those who know the true story, it might be hard to laugh without feeling a little guilt for finding such things funny. Joao Silva and Ken Oosterbroek’s characters, who were played by talented South African actors Neels Van Jaarsveld and Frank Rautenbach, were sadly not given much screen time compared to Greg and Kevin’s characters. I left the theater almost feeling like they weren’t really part of the story all that much. A special mention must be given to a short cameo appearance from South African actor Vusi Kunene who plays the father of a slain boy from the townships, who gives the most emotional and moving performance of the entire film and easily outperforms his American household name colleagues. Overall, the movie was not what I was hoping. I was disappointed with the overall execution. But that’s not to say it isn’t worth watching. For die hard photography fans, they will appreciate the large amount of photography banter throughout the movie, and even for fans of the book, it’s worth watching the recreation of the township scenes and to see those iconic photos recreated on the big screen. There are many historical inaccuracies, which are hard not to notice, like the occasional modern mini-bus taxi’s driving in the background, but if you can ignore that it is an enjoyable movie, particularly if you’re South African. Did you know the cameras that the characters used in the film were supplied by the very same camera shop that the original Bang Bang club members bought from?